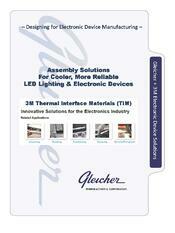 Then at Gleicher, we make great products better! We go beyond converting tape. We may not be the least expensive going in the door, but we strive to be the least expensive on the way out. Since 1949, helping engineers with custom samples to enable rapid prototyping. AT WHAT STAGE IS YOUR ATTACHMENT PROJECT? We all want to get it right the first time. That means asking the right questions about chemistry, geometry, and assembly. Our primary sources are 3M, VELCRO® Brand, and Avery Dennison. They offer thousands of products. Which one do you need? We're a close-tolerance fabricator with high end facilities. The US military is a customer. It doesn't get more demanding than that. We are Top 25 among 3M Converters, and certified VELCRO® Brand Preferred Converter Distributors of custom die cut 3M products and Industrial Strength VELCRO® Brand Fasteners, VELCRO® Brand tape, 3M tape, masking tape, removable tape, 3M adhesives, specialty fasteners, vibration dampening, sound dampening, rubber feet, anti-slip tape, protective tape, protective film, emi shielding, adhesive systems, and release liner solutions. Parts supplied in rolls, sheets, pads, or individual pieces.